"But each in his own order: Christ the firstfruits; then they that are Christ's, at his coming" (I Corinthians 15:23). Despair turned to excitement on that first day of the week so long ago when Jesus arose from the dead (John 20:1-31, etc.). In the midst of all the excitement, however, there was one theological conundrum that needed to be addressed. The idea of resurrection was not foreign to the Jews; the Pharisees believed in the resurrection (Acts 23:8), and no doubt many other Jews did also. But "the resurrection" in which they believed was the resurrection on the last day. That is what Daniel 12:2 seemed to indicate. It certainly was the expectation of Martha when Lazarus died (cf. John 11:24). But someone rising from the dead in the resurrection before the end? This was not something you would automatically take away from a reading of the Old Testament, nor was it something immediately obvious to Pharisees and others. Perhaps this was part of the challenge the disciples faced in not understanding Jesus' predictions of the event (Mark 9:30-32, etc.). How could it be that One could rise from the dead before everyone was raised from the dead? The Holy Spirit, through Paul, would make this understandable. Jesus was the firstfruits of the resurrection! "The first-fruits of thy grain, of thy new wine, and of thine oil, and the first of the fleece of thy sheep, shalt thou give him." The firstfruits were the first part of a harvest-- the first wheat or barley harvested, the first wine processed, the first of the fleece shorn, and so on and so forth. The Israelites were to devote the firstfruits to God (Exodus 23:19), and God gave them to the Levites for sustenance (Deuteronomy 18:4). After the firstfruits had been offered, the rest of the harvest belonged to the people for their own consumption and use. The firstfruits image, therefore, helps us understand the relationship between Jesus' resurrection and the resurrection on the final day. Jesus is the firstfruits-- the first to rise from the dead, never to die again (I Corinthians 15:20). He had been given as an offering to God to atone for the people (II Corinthians 5:21; Hebrews 9:1-15). He paves the way for the resurrection to come, the resurrection of which we all take part (John 5:28-29; I Corinthians 15:12-57)! There is something obvious about the firstfruits that is important for the resurrection. The firstfruits are not different in kind or type from the harvest that comes later. 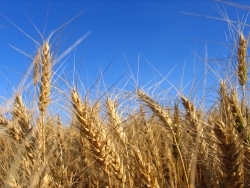 The firstfruits of wheat are wheat just as the "second fruits" or "third fruits" would be; the same goes for barley, wine, fleece, and the like. So it is with the resurrection: we should not believe that our resurrection will be something different from Christ's resurrection (I Corinthians 15:23). The difference involves time, not type or kind. As Jesus died in the flesh but remained alive in the spirit (II Peter 3:18), and was then raised bodily from the dead, the tomb being empty, and His flesh being transformed for immortality (Luke 24:1-49), so it goes with those who serve Him. All who have died, and those who will be dead before His coming, remain alive in the spirit, but will then be raised bodily and transformed for immortality (I Corinthians 15:35-57; Philippians 1:21-23; 1 Thessalonians 4:13-18)! In reality, the resurrection is a challenging concept, for one of the few "guarantees" in the physical realm is that once one dies, one is always dead. We do not see people rising from the dead, never to die again. Yet that is precisely the hope by which the Christian must live (cf. Romans 8:20-25). And we have confidence in that hope because of Jesus the firstfruits. We do not have to wonder whether God can or will raise the dead, for we know He raised Jesus from the dead. If He is able to raise Jesus from the dead, He is able to raise us from the dead also, and He has promised to do so (Romans 8:11)! The last enemy, indeed, is death (I Corinthians 15:26). Through Jesus' life, death, resurrection, and lordship, believers now can have confidence in their spiritual regeneration in this life (Romans 6:1-23, 8:1-9). The believer is able to be a new creature in Christ (II Corinthians 5:17), yet we are all still cursed with physical death. But death will be abolished. The day will dawn when we all will have the victory over not just sin but also death through Jesus Christ our Lord, and on that day the rest of the harvest will be brought in to the praise and glory of God in Christ (I Corinthians 15:53-57; II Peter 1:6-7). We can have complete confidence in this because Jesus gained the victory over sin on the cross and over death in the resurrection, and He is the firstfruits! Let us all serve God so that we may attain to the resurrection of life (cf. Philippians 3:11-13)!